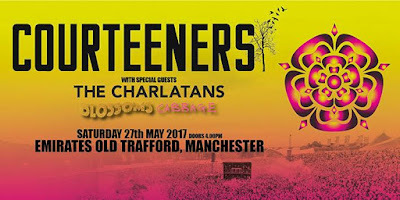 Old Trafford on Saturday saw one of the biggest security operations in Manchester's history as 50,000 people descended on the cricket ground for Courteeners' mammoth hometown show. We caught the three support acts - homegrown heroes Cabbage, Blossoms and The Charlatans. There's a lot of defiance in the air and that spreads to the bands as Cabbage come on to stage talking of the Manchester spirit and dedicating their set to those most affected before calling us the best city in the world before final song Kevin. They've come a long way since the chaotic often shambolic early shows in town where you'd never imagine them on a stage this size. Uber Capitalist Death Trade, Necroflat In The Palace and in particular Dinner Lady are the perfect warm up for those itching to let loose and dance and jump around and the final punch to the gut of Kevin brings things to a furious conclusion. Next up are Blossoms, a band for whom this type of event must surely be a long term goal, and their eight-song set demonstrates just why that's far from outside the realms of possibilities. Far more than any band in a long time they understand how to mix pop and rock music into a fusion that appeals to all ages without compromise. It feels like a greatest hits set in an era where guitar bands don't have hits, but every song is sung back at them with the gusto usually associated with headliners. They take the intro to Blow and sing back the music to them, whilst the recent Chase And Status collaboration This Moment doesn't feel at all out of place amongst the tracks from the debut album. Tom dedicates My Favourite Room to a girl in the front row who's recently been dumped and despite the song's hushed acoustics it doesn't feel out of place in a stadium. Blown Rose is as majestically evocative and beautiful and when they deliver Charlemagne, the whole front section loses itself for two and a half minutes. One day this kingdom will be theirs. The Charlatans are old hands at this game and they deliver a perfectly paced set that isn't afraid to showcase their new album Different Days released the day before whilst keeping the more casual fans sated with a trip through their expanding collection of big singles. North Country Boy, Just When You're Thinking Things Over, One To Another, The Only One I Know and the ever-present set closer Sproston Green are known to most of the crowd whatever their age and are welcomed with gusto. Previous album Modern Nature, which resurrected their profile, is represented by two of its highlights - Come Home Baby and Let The Good Times Be Never Ending - which stand the test against their better known counterparts. The two new songs - the title track Different Days and the album's lead single Plastic Machinery - are intelligent choices to showcase the record as some of the album's more experimental moments could well get lost in the scale of this event and the atmosphere. With them gone we head back into Manchester and leave the rest of the 50,000 to what by all accounts was a spectacular career-defining show.